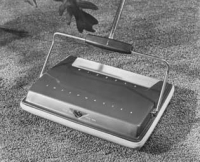 In 1954, the Sweepmaster, designed by James G. Balmer, Jr., IDSA and Frederick W. Hertzler; and engineered by Carl B. Denny, all of Harley Earl Associates, Inc., was introduced by the Bissell Carpet Sweeper Company. The Sweepmaster won a design award in 1955 from the Industrial Designers Institute (IDI), which was the only US design organization presenting national design awards between 1951 and 1965. The Bissell sweeper was invented in 1876 by Anna and Melville Bissell in Grand Rapids, MI. Thirty years later, in 1906, over 3000 per day were being produced, and Bissell announced that its sweepers were "the only brand advertised nationally to consumers". This was two years before Hoover introduced its first vacuum cleaner. A more recent Bissell design, the Trio Vac, a lightweight stick vac designed by INNO design, Inc. and Bissell Industrial Design, was introduced by Bissell in 1992. Harley J. Earl (1893-1969) automotive designer, was born in Hollywood, where his coach-maker father in 1908 founded the Earl Automobile Works, and from 1911, built custom car bodies for film stars. Don Lee, a West Coast Cadillac distributor, bought the company (including Harley) in 1919. Earl's talents were soon recognized by Larry Fisher, Cadillac Division president, and Earl was sent to Detroit in 1925 where he established GM's Art and Color Department in 1927. He became VP in 1940, and dominated GM design policies until his retirement in 1958, naming William Mitchell as his successor. In 1945 he established his own firm, Harley Earl. Inc., which in 1964 merged with Walter B. Ford Design Associates, Inc. to form Ford & Earl Design Associates. James Gilmore Balmer, Jr., IDSA (b. 1922) is a US industrial designer born in Pennsylvania and graduated from Carnegie Institute of Technology in 1943. He worked from 1946 to 1959 for Harley Earl Associates, Inc., serving in a variety of positions, and ending as executive vice-president. In 1959 he was co-founder and president of Armstrong/Balmer and Associates, Inc. until his retirement in 1988. Printer-friendly version | Tags: Houseware, James G. Balmer, Jr.